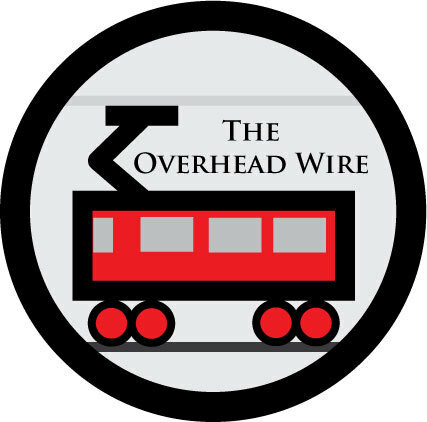 Kevin Flynn (Formerly of the Rocky Mountain News) reports that the first Fastracks LRVs have arrived in Denver. Some in Portland are worried about gentrification and displacement in neighborhoods that Portland plans to run streetcars through. I wonder though if lots of close in neighborhoods get streetcars they will all gentrify. It seems to me that gentrification occurs due to exclusivity. If you built a bunch of lines at the same time, will there still be the same effect? The same issue could arise in Denver where there will be five new lines. Interested to see what other think. Why don't we electrify our freight lines. Even if the lines are powered by a bit dirtier pollution, it will still come from only one power plant away from the population center until alternative energy is put in place. That is better than say every engine pushing pollutants into the neighborhoods that freight lines run through. West Oakland is notorious for this very issue. I also wonder how much of the particulates in say the Port of Oakland are due to switchers. What if we just electrified the rail yards first with electric switchers? Developers are waiting before they start developing around the new Purple Line. Oh, and this is the first time I've written a comment on this blog using my Google account. You are exactly right about "gentrification." The property values in human-scale walkable urban places with convenient (rail) transit access increase once the transit comes on line because there are more people interested in living there than there is housing stock. The only way to make a commodity less expensive is to make it less scarce. The only way to make it less scarce it to build more transit to existing walkable urbanism, retrofitting strip malls along existing transit and other methods of increasing the transit-oriented human-scale walkable urban real estate product availability. Gentrification only occurs in exclusive neighborhoods? What is Williamsburg, then, a gated community? That is not what I meant by exclusivity Alon. As Cavan states, stations on new lines make those small number of stations a scarce resource. That scarcity makes it more exclusive and more likely that developers will build higher end projects that can lead to displacement. If we had more station areas to develop around, we wouldn't have the same issues of scarcity and its likely that more mixed income housing types would result, possibly balancing gentrification issues. We haven't seen this yet though so we can't really know. We have had this experiment for two decades in Washington. There are plenty of stations that have not gentrified. Williamsburg isn't exclusive by that metric, either. It's a neighborhood that's close to the Manhattan core without being in it, which is why it's gentrifying. Since it's already quite expensive, you see gentrification in neighborhoods abutting the East River waterfront neighborhoods: Sunset Park, Astoria, Bushwick, Long Island City. 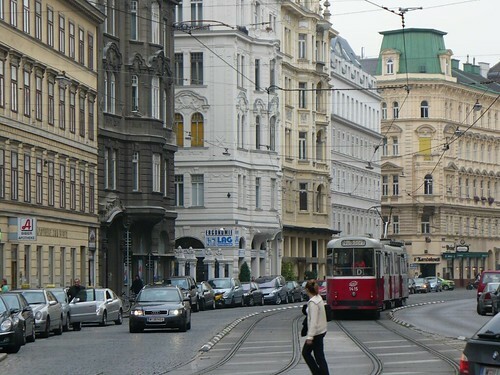 if that photo of vienna was a downtown in the US, that street would be 8 lanes of traffic... no on-street parking, the "tram" tracks would be open to mixed traffic and that wide single lane (where the traveling car is) would have 2 travel lanes squeezed in... for 4 lanes in one direction. and thats just one side of the side, the other direction of traffic in the photo looks to be just outside of the photo. I suspect that if American freight railways do start electrifying, it would probably start in California. The combination of heavy traffic and mountains, makes electrification worthwhile, and the presence of passenger rail means costs can be shared and a larger startup segment can be done at once (UP Roseville-Reno gets extended to Oakland or San Jose, for example). But I think freight railroads are not going to be looking to electrify for at least another few years, until traffic and revenue (and oil prices) start rising significantly again. On the question of streetcars and gentrification in Portland. Inner city Portland is gentrifying anyway. Even the areas that were considered really scary and desperate in the 70s when I was a kid have Starbucks and Whole Foods now. The Mayor lives in one of them, in fact. Adding streetcars in inner-city Portland may help make the gentrification at higher density, but it's already too late, I fear, to preserve much affordability. And if you added a whole bunch of inner-city streetcars at once, I bet the effect would be to saturate the market for high-density gentrification, so you'd get low-density gentrification instead. But you'd still get gentrification; in fact, that's one of the streetcar's goals. One of the interesting ideas in the recent streetcar study out of Portland was to create a new streetcar line in the Gateway area, which is 100 blocks east of downtown and basically a neglected inner-ring suburb. That might produce more affordable housing outcomes, given that land is much cheaper there. i believe there were plans in the early 90s to electrify metrolink commuter trains in the LA area and possibly some of the port freight operations. this all was part of an air quality plan for southern california that also called for the electrification of metro bus lines in LA. i highly doubt the whole portland streetcar plan will be built, its just too much money and many of the routes would complicate the existing bus routes in the same corridor. what i think is much more likely is that now that this report is out, certain communities and supporters will promote the construction of their respective line while other communities will be indifferent to their proposed streetcar line. a few lines will be built and they will be the ones with the most community support and whom are willing to do what it takes for a line to be built... this may be allowing the neighborhood to be upzoned (which is not very popular in portland). one corridor that has been mentioned for streetcars is SE hawthorne blvd, its a classic streetcar corridor but the 4 (2+2)travel lanes on the street are very narrow, so much so that the busy #14 bus actually takes up part of a second lane when it goes down the street. so for a streetcar to work on this street it would require major changes to the traffic pattern of the street and likely going from 4 travel lanes to 2 travel lanes. even in portland, that is unlikely. SE portland is also probably the most bike-centric area in the US and obviously bikes and streetcar rail dont mix so I'd expect some opposition there too. my point is its things like this that will get in the way of several of these lines from being constructed and so the places with the least resistance and most support will see them built. this is also why i think they need to look at ETBs for some of these corridors. Jon, could you explain how streetcars and bikes don't mix? Aren't they complimentary? the bike wheels get caught in the track flangeway. its especially a problem when the tracks are in the right-most lane since thats where the bikers typically go. on the SLU streetcar it is quite problematic. a lot of cyclists have issues with this. that said, i agree bikes and streetcars do have much in common particularly with urbanism, sustainability and livability issues. i think they can mix so long as cyclists use extreme caution around the tracks and when possible tracks are laid in the center lanes. but streetcar tracks will be an issue amongst the cycling community. "I suspect that if American freight railways do start electrifying, it would probably start in California. The combination of heavy traffic and mountains, makes electrification worthwhile, and the presence of passenger rail means costs can be shared and a larger startup segment can be done at once"
For the same reasons, I suspect it will actually start in Washington State. Furthermore, BNSF is the most pro-electrification of the Class I railroads at the moment. On an unrelated note, Amtrak has recently made a priority electrification of the Washington D.C.-Richmond, VA rail corridor.